The tough Philippine National Police Director General Ronald “Bato” dela Rosa confirmed the news about the assassination tip from the US Homeland Security where the two gun smugglers was arrested together with the parts for 100 M16 rifles. Those gun parts shipped from the United States and intercepted on Aug. 6 in Bacolod City would be used to assemble weapons for the assassination of President Duterte. The gun parts importers was identified as Bryan Ta-ala and Wilford Palma, who've arrested during the raid. The two arrested men are willing to cooperate in the investigation on the alleged plot to kill the President, Dela Rosa said. PNP chief said Palma, who was presented to reporters, had told investigators that the gun parts were ordered by a “client” who claimed the automatic rifles assembled would be used to kill the President. Ta-ala was being treated in a hospital after the raid, Bato added. The confiscated balikbayan box was containing the gun parts, valued at P4.5 million, that when assembled would make 100 M16 rifles. A case was filed against the two men for violation of Republic Act No. 10591 (Comprehensive Firearms and Ammunition Regulation Act). On the other hand, the president is not afraid about the plots to kill him, according to Presidential spokesperson Ernesto Abella said, Mr. Duterte was "concerned, but not worried." "He eats (death) threats for breakfast. Meaning to say, it’s not something new to him," Abella told a news briefing. 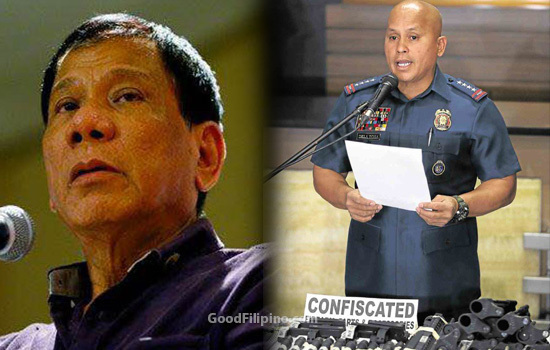 Comments or suggestions about "PNP chief Bato confirms assassination plan for President Duterte" is important to us, you may share it by using the comment box below.